Beautiful and vibrant colors and looked exactly like the picture. 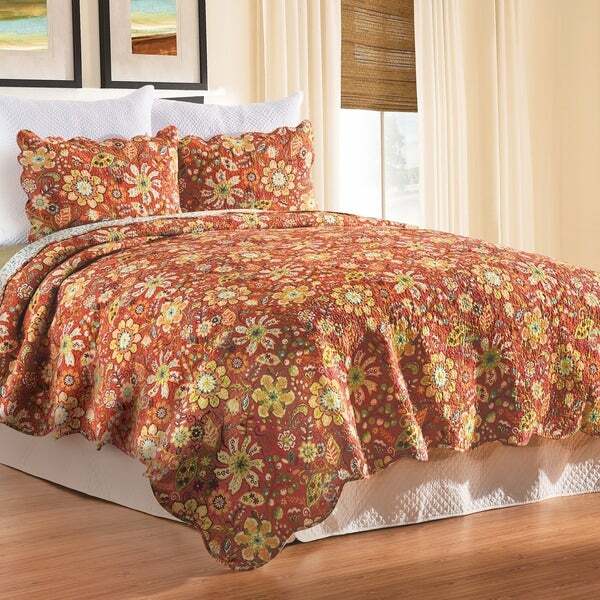 Brighten up your bedroom with the whimsical Ghisella quilt set. In a vibrant kaleidoscope of colors, vintage style florals paint the top of a retro inspired orange ground. Reverse to a coordinating petite teal and white floral print for additional styling options. Finished with vermicelli stitching and a fabric edge, the Ghisella quilt is crafted of 100-percent cotton and is machine washable for easy care. Coordinating accent pillows, euro shams and bed skirt available separately.